White House Down (2013), PG-13, 131 minutes - White House Down follows Olympus Has Fallen this year in much the same way that Armageddon followed Deep Impact back in 1998. Both have a very similar plot: a single government agent tries to protect the President during/after an attack on our capital. I missed Olympus Has Fallen in theaters so I can't compare and contrast to two films, but I can say that despite being very formulaic and pretty predictable, White House Down gets the job done by being pretty entertaining. Cale (Channing Tatum) is a capital police officer assigned to Representative Raphelson's (Richard Jenkins) personal protection detail with aspirations of becoming a Secret Service Agent. The day of his Secret Service interview, he brings his daughter to the White House for a tour. The interview doesn't go so well. Former high school acquaintance (and maybe more?) Agent Finnerty (Maggie Gyllenhaal) conducts the interview and is not impressed with Cale's recent credentials, placing more emphasis on his younger irresponsible days. Then while on the tour with his daughter Emily, all hell breaks loose as a group of mercenaries lays siege to the White House. It's a very coordinated and efficient attack that catches everyone off guard. Cale starts off determined to find his daughter to make sure that she is safe (she had gone to the bathroom when it all went down), but while he's looking for her, he overhears radio chatter about the President's location. His instincts kick in and he gets sidetracked as he makes every effort to protect President Sawyer (Jamie Foxx) from the impending danger. The rest of the film is Cale juggling his sense of duty to his country with his fatherly duties in protecting his daughter amid this national crisis. 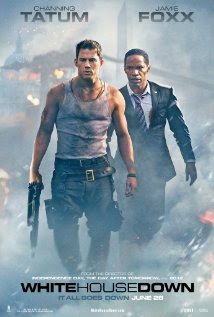 The strongest thing White House Down has going for it is the combo of Channing Tatum and Jamie Foxx. Both are good, likable actors that play characters that you can relate to and pull for (even if they are a wannabe-Secret Service Agent and the President of the United States respectively). The rest of the cast is full of recognizable actors and actresses, all of whom have pretty respectable resumes (Jason Clarke, James Woods, Lance Reddick, Gyllenhaal, and Jenkins). The story is a bit predictable and it is a Roland Emmerich film so there's big action and lots of explosions, but all in all, White House Down is an enjoyable movie. - Jason Clarke is very strong as Stenz (the head mercenary). It's kind of odd, because that character is almost an alternate universe version of his character Dan from Zero Dark Thirty. - I'm sure that it was done consciously, but Channing Tatum running around in a wife beater, taking on a terrorist threat echoes Die Hard like nobody's business. good action but not anywhere near a strong plot to back the action typical american white house attack movie u may instead choose from other strong action flicks like iron man shooter etc.